i am looking for some affordable 2 deck 2 pole 6 position rotary switch shorting . My intention is to use it as a frequency selector in a stereo eq to use it on both channels L&R. Could this one or this one work? Or do you know any other good sources? Do you mean make before break 2 pole 6 way *per deck*, i.e. 4 pole 6 way in total? If so the Mouser one is correct. The other is break before make. thank you. I'm not sure if it actually needs to be shorting, but i read that people prefer break before make better when choosing frequencies? oh and i found another one which would be way cheaper: https://www.ebay.de/itm/273433341629 ! I have used these before. They need a lot of force to turn them! I was looking to use these on my next build. Look like they're higher quality than the standard Lorlin plastic jobs, but won't break the bank..
indeed, they look nice, but i absolutely need 2 decks, these are single deck only.. So you can see the two "decks". But the terminals that do not have pins, are not useable. There are only 10 pins on the part and 2*6+2 = 14. So you can see the first two positions of one pole and last two positions of the second pole are not useable. Also, the total travel of rotation is only 180 degrees for 5 positions (so 225 total for 6 maybe). All strange but still very useful in many instances. In this particular instance I only effectively used one pole. But I like the feel of these over the Grayhill. If I absolutely need all postions of both poles I use Grayhill 56BD30 which are smaller than the Grayhills you listed but are still hard to turn and have a bit of slop to them. Right. Sorry. 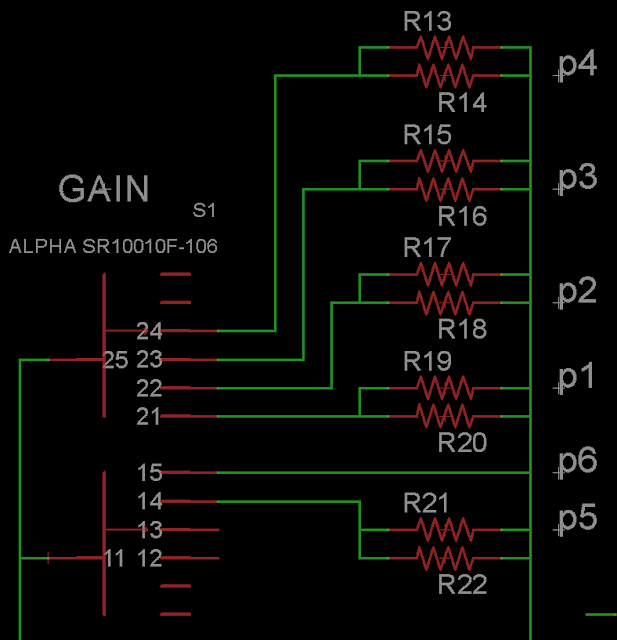 So 14 minus 2 contacts of each pole leaves only 10 pins for the Alpha SR10010F-0106. Odd part. But still useful and it has a very nice smooth feeling. Much nicer than the Grayhills. funny. didn't know there were switches like that. C & K have a rotary switch that looks like the Lorlins but they have a better current rating & look to be a bit more rugged. Mouser stocks them. They are priced in the neighborhood of $6 to $8 each in USD. I will be using them in the high quality headphone amp/preamp I am starting to manufacture. Recommendations for a two-pole, six-position rotary? Source for the 1176 4-pole, 3 position rotary?